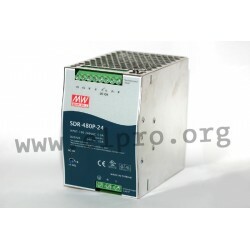 These power supplies in enclosed case can directly be mounted on DIN rail and are endued with touch-guard screw terminals, universal input, single output and power-on LED display. Further facilities are built-in active PFC function, parallel function (7+1), DC OK relay contact and peak load capability. The devices are protected against short circuit, overvoltage and overload by current limiting (hiccup after 3s, auto recovery). 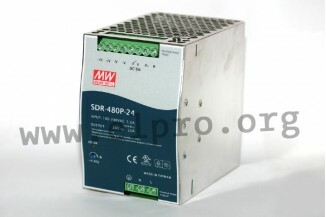 We offer the types SDR-480P-24 and SDR-480P-48by manufacturer Mean Well.